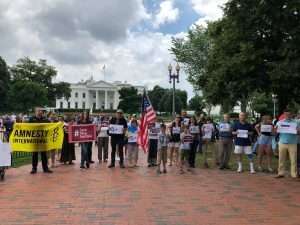 .Washington, DC joined the worldwide campaign to #SaveOlegSentsov. Today marks the 20th day since Oleg Sentsov is on a hunger strike. His only demand is the release of all Ukrainian political prisoners that are held in Russia. People around the world come together in response to Oleg’s action, and his voice gets amplified. We hope that the reaction of the world will help to bring the release of Kremlin’s hostages and #SaveOlegSentsov. We met near the White House, holding signs and Ukrainian flags. In their speeches, community activists stressed that every little act of support helps and that together we will change this situation. The names of all Ukrainian political prisoners that are held in Russia were listed on a poster, and each one of the names has been read aloud. Many of the prisoners are Crimean Tatars who suffer only because they support Ukraine in their home, in the occupied Crimea. Thank you everyone who joined us today!. 1. To the Russian authorities: to release Oleg Sentsov and all political prisoners. 2. To G-7: to put the issue of release of Oleg Sentsov and all political prisoners to discussion during the 44th G-7 Summit, on June 8-9 in Canada. To initiate a separate negotiation process between Russia and Ukraine to release Ukrainian citizens convicted in Russia and the occupied Crimea for political reasons and to act as mediators in such negotiations. 3. To the authorities of the country (where the action will take place): if it participates in the events around the FIFA World Cup, as well as in other official events, raise the issue of the status of human rights and political prisoners in Russia and the occupied Crimea. 4. To the civil society (where the action will take place): to support the motto “I support political prisoners at the World Cup in Russia”. 5. To the Ukrainian authorities: to create a position of special representative on the rights of Ukrainian political prisoners held in Russian and the occupied Crimea. This entry was posted in Raising Awareness and tagged DC, Diaspora. Bookmark the permalink.